Well, that was a packed day! It started early, running into many fellow woodworkers in the hotel lobby, and directing instructor Ron Herman to the orange juice at the breakfast buffet. The excitement for the day was palpable in the air, and we were all getting fueled up for a long day of learning. My class list included Sketchup with Bob Lang, Tenons on the Tablesaw with Glen Huey, Routers with Marc Adams, Router Planes with Chris Schwarz, Bowsaws with Roy Underhill and Dovetails with Frank Klausz. With so many options, I know that I was missing out on some great classes, and wished I could be in 6 places at once. And that’s not even mentioning the exhibit hall downstairs, featuring many exciting vendors and demonstrations, including Lie-Nielsen, Festool, Glen-Drake Toolworks, Epilog Lasers, Handcraft Woodworks and dozens of others. 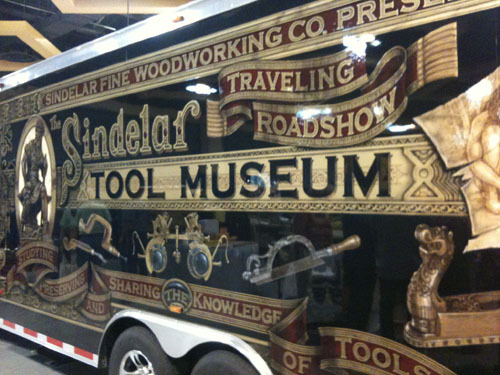 And to top it all off, the Sindelar Museum Traveling Roadshow made the trip down from Michigan and drove right into the convention center for all to see. The tools in the Sindelar museum were intricate, strange and beautiful. Really amazing stuff and a definite highlight of the day. 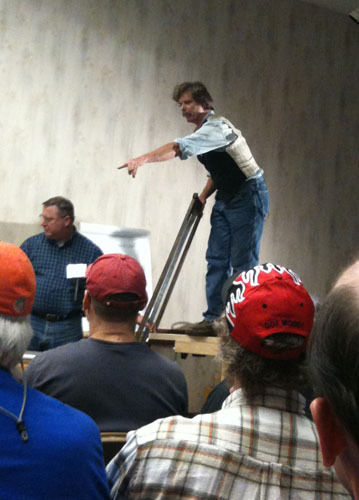 Seeing the first tablesaw cut made at a WIA conference in Glen Huey’s Tenons on the Table Saw class. Learning the history and details of ‘the Misunderstood Router’ in Marc Adams’ incredibly thorough class. Hearing Chris Schwarz giddily discussing the historic use of the “Hag’s tooth” plane, one of the original versions of today’s router plane. Getting to see Frank Klausz cut dovetails – there were only a few people in the class who hadn’t seen him demo it before but it was certainly an impressive thing to behold. Made me want to go try it at home. Seeing Roy Underhill climb up on the bench to show the use of one of the bowsaws in his class. The picture shows him about to try to beat his previous 8 second record for sawing off a certain thickness. I’ll upload the video when we’ve got a better internet connection! And finally, the keynote dinner, with a speech/roast/entertainment by Roy Underhill and Frank Klausz, and getting to hang out with the Lie-Nielsen folks. Getting ready for another big day tomorrow!